Sipping a cup of this flower rich tea is like aromatherapy for your digestive and nervous systems—both of which are calmed by the comforting effects of the essential oils concentrated in the chamomile and lavender flowers.Traditional Medicinals Organic Chamomile with Lavender Tea is used in Herbal Medicine to help relieve mild digestive disturbances such as dyspepsia, flatulence, bloating, and belching. It also relaxes you and help promote a good night sleep. 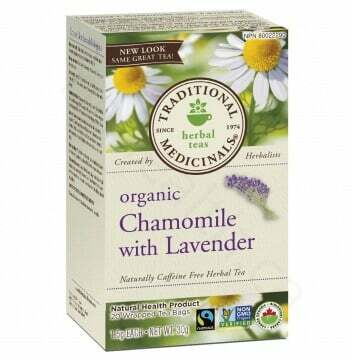 Each tea bag (1.5 g) contains: organic chamomile flower (Matricaria recutita)* 600 mg, organic lavender flower (Lavandula angustifolia) 450 mg, organic lemon balm leaf (Melissa officinalis) 450 mg. Adults: Drink 2-3 cups daily. 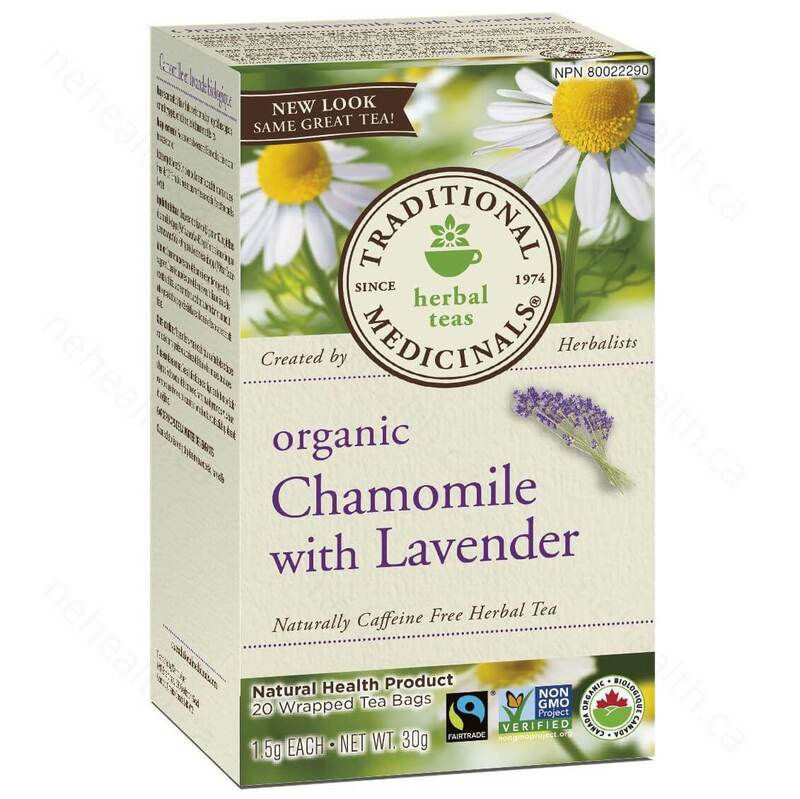 Directions for use: Pour 240 mL freshly boiled water over 2 tea bags and steep, covered, for 10-15 minutes. Gently squeeze the tea bags to release the remaining extract. Cautions: Consult a healthcare practitioner if symptoms persist or worsen. Consult a healthcare practitioner prior to use if you are pregnant or breastfeeding. Consumption with alcohol, other medications or health products with sedative properties is not recommended. Contraindications: Do not use if you are allergic to plants of the Asteraceae/Compositae/Daisy family or to plants of the Lamiaceae /Labiatae family. Adverse reactions: Hypersensitivity (e.g. allergy) has been known to occur; in which case, discontinue use. Some people may experience drowsiness. Exercise caution if operating heavy machinery, driving a motor vehicle or involved in activities requiring mental alertness.